Stretching for 32 miles off the coast of Long Island, Fire Island is a barrier island that forms the center of the cluster of outer barrier islands located along the south shore of Long Island in New York State. Plan a fun day trip from NYC to Fire Island, NY, home to a diverse range of natural landscapes, from sand dunes to forests, as well as vibrant towns, tranquil hamlets, and pristine beaches. Here are the best things to do on Fire Island. Located at the western end of Fire Island, Robert Moses State Park is an 875-acre state park that boasts five miles of beautiful beaches overlooking the Atlantic Ocean. Established in 1908 and named after mid-20th-century urban planner Robert Moses, the park is the oldest state park on Long Island and offers a variety of outdoor activities and attractions for visitors to enjoy. Anglers can fish from the piers, golfers can practice at the 18-hole Pitch & Putt golf course, and families can relax over picnics in designated areas. The beautiful beaches offer swimming, surfing, and beachcombing, and a day-use boat basin can accommodate up to 40 boats. The park also has several volleyball courts, first aid stations, and a playground, and it is home to the famous Fire Island Lighthouse on the Fire Island National Seashore. The park is open year-round from sunrise to sunset and is accessible from the Robert Moses Causeway across Great South Bay. More ideas: 16 Best Things to Do in Montauk, Long Island and 50 Best Things to Do in the Hudson Valley, New York. The Fire Island Lighthouse is a well-known landmark on the western end of Fire Island in the Great South Bay. Located within the Fire Island National Seashore and adjacent to the Robert Moses State Park, the lighthouse was originally built in 1826 and later replaced by a taller structure in 1858. It then served continuously as a navigating beacon until 1974 when it was replaced by a small flash tube placed at the top of the Robert Moses water tower. Standing at 168 feet tall with 192 steps from the bottom to the top, the Fire Island Lighthouse flashes every 7.5 seconds and its light is visible for 24 miles. The lighthouse, operated and maintained by the Fire Island Lighthouse Preservation Society, is listed on the National Register of Historic Places. 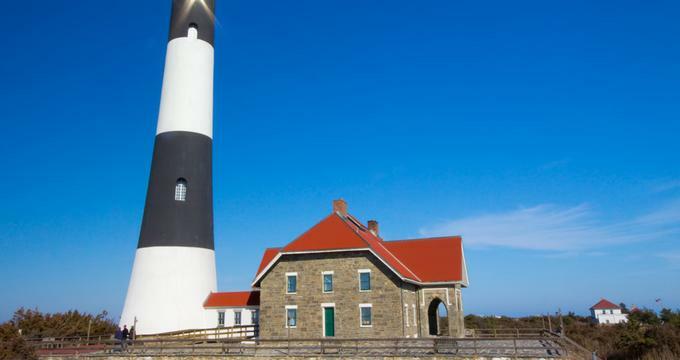 The lighthouse can be reached by a short walk from the Robert Moses State Park and is open to the public – visitors can enjoy tower tours for a small concession fee. Fire Island's Sunken Forest is a unique Maritime Holly Forest situated in Sailor’s Haven on Fire Island. Named for its unusual location, the Sunken Forest is situated in the lee of the sand dunes that run along the shoreline, giving it the appearance of being below sea level. The New York Natural Heritage Program has ranked this maritime forest as "globally rare," and it is one of only six forest types in the world. The Sunken Forest is located within the Sunken Forest Preserve, which was established in the 1950s to protect the 50-acre tract of the beach, dunes, and ancient holly forest just east of Point O'Wood and this rare ecological phenomenon. Visitors can explore the woods, which are home to a wide of variety of plant and animal species, from May to October on self-guided walks or daily ranger-guided tours. Casual, comfortable, and friendly, CJ’s is the epitome of a beachside café/bar where you can enjoy delicious food, colorful cocktails (including Fire Island’s Famous Rocket Fuel), and stunning ocean views. Featuring nautical-themed décor in cool tones, the restaurant boasts a tantalizing menu of seafood and other delights, including burgers, wraps, and quesadillas. Start with crispy fried calamari or steamed mussels followed by a lobster roll, handmade fishcakes, or marinated steak served with fries and salad. A range of sandwiches, wraps, and rolls is also available for those wanting something lighter, as well as freshly prepared salads and soups. The well-stocked bar serves a variety of cocktails – don’t miss trying the Rocket Fuel for which the café is famous – as well as fine wines, craft beers, and other spirits. SandCastle on The Ocean is a casual, inviting oceanfront restaurant in Cherry Grove that offers an innovative and creative menu against a backdrop of beautiful sea views. The stylish restaurant is airy and bright with modern décor and serves a seafood-centric menu of mouthwatering cuisine made from locally sourced ingredients. Ideal for a lazy Sunday morning brunch, a quick bite after the beach, or colorful cocktails at sunset, SandCastle on The Ocean features a menu that has something for every occasion. Enjoy Lobster Bisque, Watermelon Gazpacho, or crisp salads, followed by Jumbo Lump Crab Cakes or Fried Calamari for lunch. Signature dishes on the dinner menu include Grilled Filet Mignon, Charred Salmon, and Sesame Seared Yellowfin Tuna. A raw bar offering oysters, shrimp, clams, and Alaskan King Crab Legs provides the perfect accompaniment to sundowners and live music on the weekends. Smith Point County Park is a beautiful beachfront park located on the east end of Fire Island that offers a variety of outdoor activities, attractions, and seasonal events. Situated within the boundaries of Fire Island National Seashore, it is the county's largest oceanfront park and a haven for sportsmen, surfers, and beach lovers. The park’s pristine white sandy beaches, rolling Atlantic surf, and great camping and picnic areas make it an extremely popular location with locals and tourists alike who come to enjoy the swimming, surfing, fishing, camping, picnicking, and playground the park has to offer. A nationally recognized team of lifeguards patrol the beaches, and off-road vehicles are only permitted to drive on the western portion of the outer beach. The Smith Point Beach Hut offers a diverse menu of freshly prepared seafood and other specialties, and special events are scheduled throughout the summer months. Village of Ocean Beach is a coastal town on Fire Island that boasts beautiful natural scenery, lovely beaches, and a warm and welcoming community. The charming seaside village has a unique character with treasure-laden shops, homegrown galleries, and varied restaurants, and it exudes a laid-back, casual atmosphere. Located on the site of what was originally The Out Restaurant, Surf’s Out continues the tradition of serving freshly cooked cuisines and offering an exciting bar menu in an excellent location. Casual and relaxed, Surf’s Out features indoor and outdoor seating for lunch and dinner, a beautiful bar, and the island’s best outdoor courtyard, which is often used for hosting live music, DJ’s, and private parties. While the evenings boast a trendy scene, the restaurant caters to families during the day, with an Italian menu that has specials for kids. The menu offers delicious seafood and Italian dishes such as Maryland Crab Cakes, Lobster Risotto, Rib-Eye Steak, and a classic Pollo Parmigiana. Fresh fish ranges from yellowfin tuna, red snapper, and salmon, and a special sushi-style menu features creative takes on seafood plates. The kids will love the mac-and-cheese and good old spaghetti. Considered “The Jewel in the Crown” of the Fire Island National Seashore, Sailor’s Haven is a beautiful bay on Fire Island that is home to a wide beach, a boat marina, and the famous Sunken Forest. The tranquil coastal area is located near the center of the island and accessible by the Sayville Ferry, private boat, or foot and features a modern visitors center, convenience shop that sells snacks and gifts, and a 45-slip public marina with electricity. The beach is patrolled by lifeguards in summer and has a bathhouse with showers, restrooms, picnic tables, and grills. While the Sunken Forest is the main attraction of Sailor's Haven, the thriving gay resort town of Cherry Grove is a mile walk to the east and offers a few good restaurants, bars and gift shops.